We believe in Good Old Fashioned Customer Service, and therefore 2/3’s of our customers are repeat customers and referrals from existing customers. Why might you choose to do business with Hurricane Drain? Relax – Don’t Panic! we’ll get it fixed today or will schedule an appointment that fits your schedule. 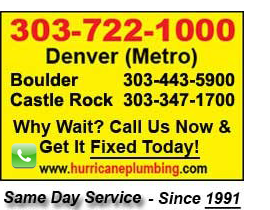 Call us at 303-722-1000. We promise to arrive quickly, diagnose the problem, and repair it in a timely fashion – because we know your time is valuable. And most importantly a company is only as good as it’s employees and our employees will make the difference. Let us help you make your home or business safer, healthier and more comfortable. We are a Colorado based and employee owned company.